I've been collecting Adam Lind since 2007 and have picked up many of his early cards, and I try to keep up with the cards as they come out. Lind is probably the only player I have followed from the beginning in my collection. Oddly enough his cards are becoming more and more expensive and despite the fact that I can turn so many for about 50 times what I paid, I am keeping all of them. I am greedy and I like stuff, I keep lots of stupid crap I don't need but this I can justify. Out of all the autographs I have (even the Sterling RC that took me like 3 years to get), I am pretty sure this is what I would consider the cornerstone to my collection. I have always wanted to be able to one of my guys names spelled out like this, thanks to some good hearted collectors, Flash from Dropped 3rd Strike who supplied the "D", and good old eBay for the "N" and the win. Sorry for the large picture, but the cards are all in protective cases and I was not removing them to scan them and risk creasing or damaging them in the scanner. But, isn't it wonderful? Sigh. it's a good thing you don't collect Jarrod Saltalamacchia. Ya know I'm sick of being out bidded on that Red 5/25 topps chrome adam lind rookie auto. I wanted to do the whole set of that and the cosigners but geeze um....now his stuff is taking off. I'm gonna go crazy over this. 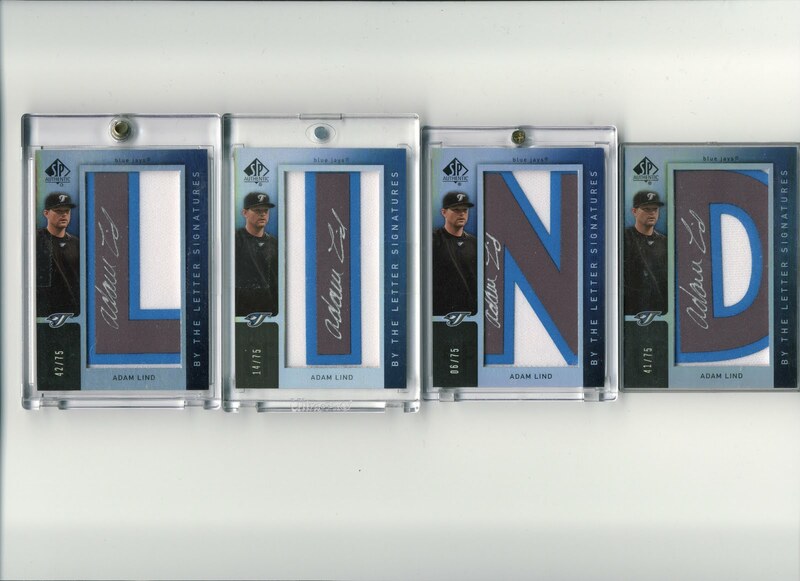 I hereby will all of my Adam Lind Collection to you if I go crazy....lol! BTW did you get any balls or bats auto'd yet of Lind? Very nice feature! I especially like that the auto appears on the same side on each card. Very nice!